The Joan Mitchell Foundation is committed to preparing artists – as well as their families, loved ones, supporters, and representatives – for the business of organizing and protecting their legacy. 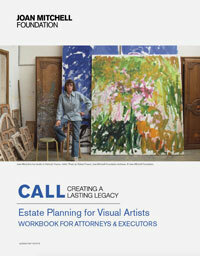 Recognizing the need for greater resources on estate planning for artists, the Joan Mitchell Foundation (JMF) and the Arts & Business Council of Greater Boston (A&BC) have partnered to create informative and helpful workbooks for use by both visual artists and estate planning professionals. Learn more about our organizations and workbook contributors here. In 2018, A&BC and JMF collaborated for a second time to produce a complementary workbook for estate planning attorneys and executors. 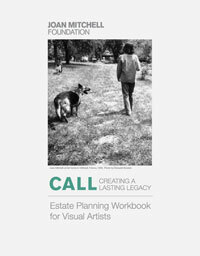 The intention of this workbook is to provide a resource and framework for those working with artists, to alert them to possibilities and issues they might not have considered, and ultimately to enlarge the pool of estate planning attorneys with knowledge and experience in this area. This workbook features in-depth information on legal issues, such as intellectual property and estate vehicles, as well as chapters designed to acquaint the attorney with art-specific issues such as conservation, inventory, and working with art professionals.